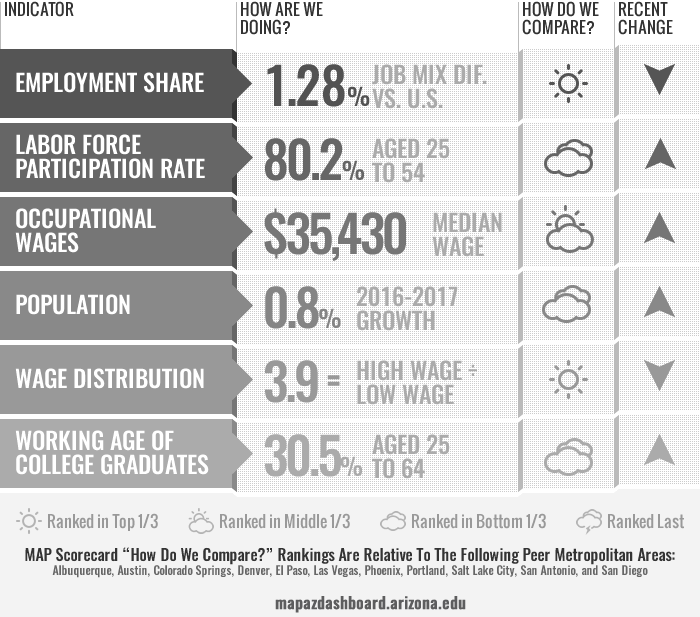 The indicators included in this section help identify the demographic mix and workforce characteristics of Southern Arizona compared to other regions in the western U.S. This data can provide government officials, policymakers, and planners with the information necessary to gauge demand for future resources. The type of resources a region may need in the future are highly dependent on the demographic mix, and could range from educational needs to infrastructure to services such as health care. Population growth is a measure of how well a community attracts and retains residents, which reflects economic opportunities. The workforce is a subset of the population and refers to those individuals who participate in the labor market. A highly educated and skilled workforce tends to generate greater economic opportunities for a region’s residents. The characteristics of a region’s population and workforce can influence the local economy. For example, important drivers of economic growth include the employment mix, population growth, the labor force participation rate, and the percentage of the workforce that is college educated. Economic growth is commonly measured by gross domestic product, income, employment, and business starts. In addition, measures such as occupational wages and the wage distribution reflect the employment, demographic, and educational mix of a region.